Sibley Park	Scenic walking paths, roses and wildflowers, tennis courts, a wading pool, playground and tot lot are here for family enjoyment. Size: 7.96 acres Neighborhood: Standish Service Area: South Commissioner District: 5 Master Plan: After two years of extensive community engagement, the Sibley Park Master Plan was approved in 2016 as part of the South Service Area Master Plan. The Sibley Park Master Plan will guide outdoor park improvements at Sibley Park for the next 20-30 years. Click the link below to view the master plan. The park features a small raised garden bed for hands-on educational gardening activities for youth. Name: The park was named for General Henry Hastings Sibley, the first Regional Governor of Minnesota, who was inaugurated in 1858. The name was approved January 17, 1923. The park board must not have been satisfied that Governor Sibley had been sufficiently honored when it had named Sibley Triangle for him only three years earlier. Prior to being named for Sibley, the park was referred to as Cedar Avenue Heights Park. One group of residents had requested that the park be named for Miles Standish. Acquisition and Development Sibley Field was designated for purchase by the park board November 16, 1921, the same day another as-yet-unnamed park, which became Bracket Field, was designated for purchase. The purchase was completed in 1922 at a total cost of $23,441 for nearly eight acres of land. The first petitions for a park in the vicinity were received by the park board in September 1921 and acquisition of the park proceeded quickly. The park board decided to purchase the land in November, and in the 1921 annual report, the first plan for the park was published. At that time the park was listed as nine acres and a year later as nearly ten acres, but the final acquisition was recalculated as somewhat less. The purchase of the land was completed in 1922 after resolving some objections to the amounts the park board was willing to pay for the land. The cost was assessed to property owners in the neighborhood. The initial plans for improvement were estimated to cost $75,000 for a “modern, up-to-date neighborhood park and play field.” An architect, Clarence Brown, was hired to design a field house for the park. The park board faced two challenges in developing the land. One, the amount allocated to development of the park was only $38,000, barely half of the original estimate. This followed a pattern in the development of nearly every neighborhood park at the time: initial plans were scaled way down in order to get property owners in the neighborhood to agree to pay for them through assessments on their property. The second challenge was the topography of the park. Park superintendent Theodore Wirth wrote in his 1923 annual report that the “formerly unsightly low land” was brought to “attractive and serviceable” grades by using a steam shovel and horse teams to move 68,000 cubic yards of sandy soil. The project was complicated, and more expensive than estimated, because all four corners of the park were at different grades. 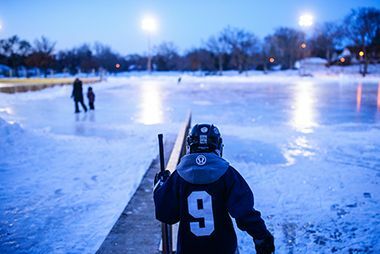 Development of the park began in 1923, concurrent with development of Chicago Avenue (Phelps) and Nicollet (King) parks in south Minneapolis, Linden Hills in southwest, and Sumner and Folwell in north Minneapolis. The basic grading was done by early July and the park board authorized Wirth to move the grading equipment from Sibley Park to Folwell Park. By 1924 the playground was installed and a recreation shelter was completed in time to serve as a warming house for skating that winter. Wirth noted that the tennis courts and walks remained to be done, but would be completed for the 1925 playground season. The park was not quite completed by then, as is evident from Wirth’s report in 1926. At that time he wrote that Sibley Field was practically the only project in recent years where the costs of improvement were underestimated, mostly because so much earth had to be moved to create a level area for playing fields. Wirth wrote that he still needed another $6,000 to complete the work, including $3,000 to install lights in the park. 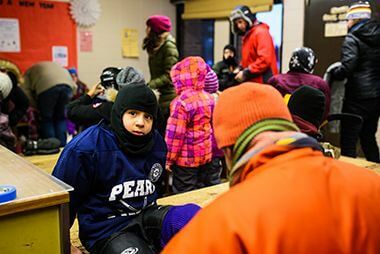 Following World War II the park board greatly expanded recreation programming in parks and in 1946 chose Sibley as one of only five parks in the city to offer year-round programs. (The others were Folwell, Nicollet (King), Loring and Logan. Folwell and Sibley were the two most recent additions to that list. 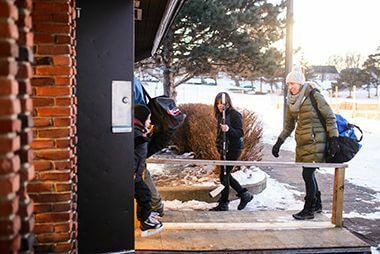 A sixth year-round community center was not added until 1956 when programming at North Commons was expanded.) 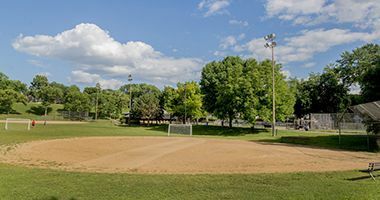 Sibley Field was also one of nine parks at which senior citizen clubs were started in 1963, after the success of an experimental program at Loring Park in1960. The club met for four hours one day a week. Other than some landscaping at the park through federal work-relief programs in the 1930s, the first improvement at Sibley Field after its construction was a remodeled wading pool in 1963. But by 1967, the park board was planning a complete renovation of the park and a new recreation center. The board included $450,000 in its bond program for Sibley Field’s renovation for 1969. In 1969 the park board awarded contracts for a new $172,000 recreation center at the park. The center was completed in 1971. The playgrounds and playing fields were also upgraded at that time. The playgrounds were updated again in 1994. Internet-based thermostat controls were installed in the recreation center in 2009 to improve energy efficiency and in 2014 the basketball court was resurfaced. History through 2008 written by David C. Smith, with updates from 2009 to present written by MPRB. 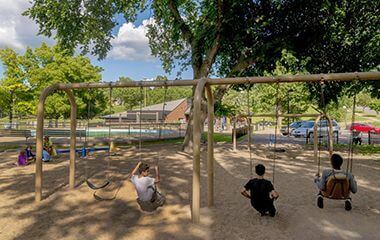 Sibley Park features both a full size playground and a tot lot for the smallest family members. 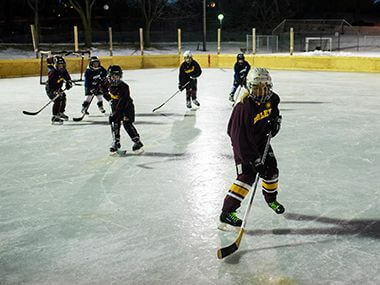 Sibley Park offers outdoor programming year-round with ice skating and hockey in the winter. 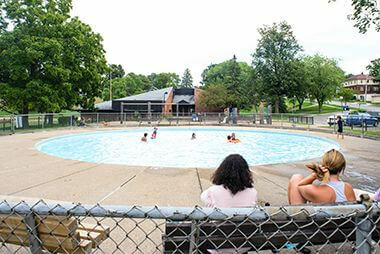 Cool off in the summer at the Sibley Wading Pool. See our other wading pool locations.